The deeper bowl, dissolve the yeast with a little lukewarm water or I melt it down and the beer. (Slightly warmed beer 35C.-although what I yeast. Add the other ingredients, flour, oil, sugar soli..I knead compact mass.important to have purpose flour. Leave rolls to stand and stature dough, about 45 min- 1 hour. (You can the jug with hot water for fast that you stase dough). 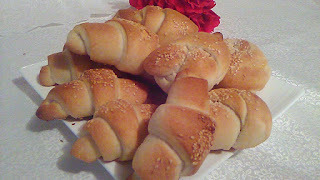 Rolls can be charged with jam or cheese, very tasty and soft rolls.My coments is very very delicious dough.And I it made with beer.